Although I’m not the biggest fan of dystopian fiction, I enjoyed this old-fashioned chase story and its teen hero with extraordinary abilities but very ordinary teenage concerns. Cyrus Rhodes, under the management of his genius little brother Billy (AKA The Geek), is a top Runner — an underage smuggler of goods and information for an extensive black market, the Agora. 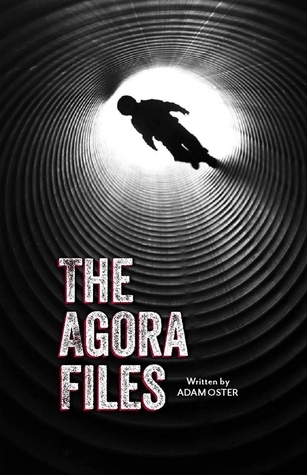 The Agora Files is set in the present-day U.S., but in a dystopian alternative reality in which a totalitarian government controls every aspect of citizens’ lives. Children attend school online under the care of assigned nannies while adults go to their assigned, low-paying jobs, often far from home. To provide for their families, many youth under 18 — the Age of Accountability (AoA)– work as Runners. They are at risk of being stopped by Street Patrols, but as long as they are under AoA, they can’t be prosecuted or jailed. This gives them more freedom and flexibility than most adults, a detail that should appeal to teen readers. A few weeks shy of his 18th birthday, Cyrus accepts a challenging cross-country assignment that promises a huge payout if he can complete it in time. To do that, he has to go against his “I work alone” ethic and accept help from strangers . . . or worse, from Eve Gardner, another Runner with whom he has a history. He soon discovers there is more at stake than the package he is delivering or his own record. In his run from the Bay Area to Boston, Cyrus encounters all kinds of obstacles, from weather and geography to hostile agents and his own fears. Using the training and skills of an ultramarathoner, he prefers to accomplish his runs on foot but in this case, must accept rides when he can, in whatever vehicle is available: subway trains, stolen cars, a rubber raft. This gives the book a wide array of settings, including an epic potluck picnic in the author’s Wisconsin hometown of Eau Claire. The journey is for the most part believable, though not something the average reader would be able to accomplish — Cyrus regularly runs sub-4-minute miles and thinks nothing of running 70 miles a day. The runners sometimes seemed to cover an awful lot of miles on very little food and water, or when not quite recovered from serious injuries. I had a bit of difficulty believing Cyrus would be able to run for miles and ride a motorcycle in bare feet (after losing his shoes on a broken down bridge) without injuring himself more than he already was. But by then, he’d shown himself to be kind of a superhero, so I was willing to just go with it and see how the story played out. The Agora Files is an exciting, low-tech action story with plenty of close shaves, daring escapes, and even a touch of romance. Cyrus grows up a lot in a short time, and by the end of Part 1, he has set himself an ever greater challenge. I’m looking forward to Part 2.